On July 11, 1995, over three years into the civil war in Bosnia, Bosnian Serb militants overran a UN-established safe zone in the eastern town of Srebrenica, separated about 8,000 Muslim men and boys from the women who had sought shelter in the area, led them into fields and warehouses in surrounding villages, and massacred them over the course of three days. It was the worst single atrocity in Europe since the end of World War II and is generally considered to be an act of genocide. With the support of Yugoslav President Slobodan Milosevic’s government in Belgrade, the Bosnian Serbs — under the leadership of Radovan Karadzic, who is now serving 40 years for war crimes — were attempting to liquidate Bosnia’s Muslim population as part of an attempt to carve a “greater Serbia” out of the ruins of Yugoslavia, the polyglot communist state whose breakup into seven different countries began in the early 1990s. Bosnia has sizable Muslim, Croat, and Serbian populations, and it was the one republic of Yugoslavia without a clear ethnic majority (see map at left). Milosevic, Karadzic, and Bosnian Serb militants under the leadership of Ratko Mladic used ethnic cleansing to cleave off as much of Bosnia as possible for the Serbian-dominated remains of Yugoslavia. The Srebrenica massacre was the inevitable result: an act of mass murder that conveyed the brutal message that Muslims weren’t safe anywhere inside of the country and that the UN and the international community were unable or unwilling to protect them. The UN had established a demilitarized zone in Srebrenica in 1993, creating an area where Muslims who had been forced out of their homes elsewhere in Bosnia could find safety from the Bosnian Serb onslaught. The massacre had been planned in advance. The week of the atrocity, Serbian forces had taken surrounding villages, forcing some 20,000 refugees inside the UN safe area. Serbian forces had also kidnapped 30 Dutch peacekeepers, a blunt instrument of blackmail and leverage over the Dutch peacekeeping force guarding the enclave. And they had started shelling Srebrenica on July 6, making it abundantly clear that they would not respect the UN’s humanitarian safe area. The Serb forces were greatly aided by the international community’s indifference. Though the UN wanted a peacekeeping deployment of about 6,000 in the area, by the time of the massacre only about 600 lightly armed Dutch troops were guarding the town. 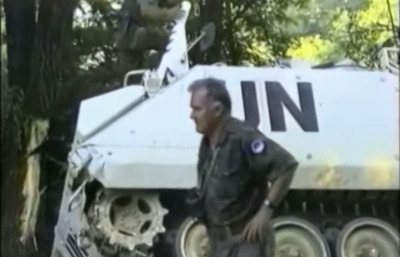 When Mladic and the Bosnian Serb army entered Srebrenica, the peacekeepers put up little resistance and even called off airstrikes when the Serbs threatened to kill their Dutch hostages. Peacekeepers were also later accused of destroying video evidence of their inaction. Far from protecting vulnerable civilians, the “safe zone” had just concentrated them in a single location that the UN apparently had little intention of actually defending. But they weren’t the only party at fault: As a Human Rights Watch report from late 1995 recounts, the NATO states remained complacent and indecisive even as the enclave’s fall was imminent, despite the clearly genocidal intentions of the Serbian forces. Serb forces started deporting all women and children from the enclave as soon as Srebrenica fell on July 11 and held nearly all of the area’s Muslim males for “interrogation.” More than 8,000 of them would be killed in the following days. Youtube / 90s War VideosGen. Ratko Mladic near an abandoned UN vehicle outside Srebrenica on July 11, 1995. The massacre galvanised international opinion and led to a US and NATO intervention in Bosnia’s civil war. Shortly after the killings, NATO bombs started dropping bombs on Serbian positions. In November 1995, Milosevic and Bosnian President Alija Izetbegović signed the US-brokered Dayton Accords, which left Bosnia as a single country while creating an autonomous Serb “republic” behind the Bosnian Serb frontline, in areas that had been ethnically cleansed of their Muslim population (see above map). The accords ended the conflict. But they led to an internal partitioning of Bosnia while arguably awarding Serb forces for their atrocities. Srebrenica played an outsize role in bringing about this indecisive end to the conflict. And the atrocity was on such a massive scale that victims are still being disinterred from mass graves in the area and identified. Each year on the anniversary of the killings, the Bosnian government releases bodies that were recently discovered, in whole or in part, in the hills and fields that surround the town. The friends and relatives of the victims attend a mass funeral each year. Even 22 years later workers are still sifting through remains and trying to identify bodies, an attempt to restore some humanity to the more than 8,000 people killed at Srebrenica. According to The New York Times, 6,930 bodies have been identified from 17,000 body parts found in dozens of mass graves. Adam Jones via Wikimedia CommonsDelegates of the International Association of Genocide Scholars (IAGS) examining an exhumed mass grave of victims of the July 1995 Srebrenica massacre, outside the village of Potočari, Bosnia and Herzegovina, in July 2007. On May 26, 2011, Gen. Ratko Mladic was arrested and detained in Serbia as a suspect in the massacre at Srebrenica. This past March, another eight soldiers were arrested on suspicion of having participated in the killings. Srebrenica is still a source of controversy. In 2015, Russia vetoed a United Nations Security Council resolution that would classify the Srebrenica massacre as a genocide. The Russian delegate cited war crimes on both sides of the war in what is now Bosnia and Herzegovina, stating that characterising the killing as a genocide was “anti-Serb.” But the International Court of Justice and many international observers have long since labelled the killings as genocidal. The massacre is still an open wound for the UN and arguably for the entire international system it represents. In July 2014, a Dutch court found peacekeepers responsible for the deaths of 300 people at Srebrenica, resolving one of several lawsuits connected to the massacre. Recent research based on declassified CIA cables alleges that Britain and US knew for six weeks that Srebrenica was close to falling to Serbian forces but decided not to intervene out of concern that the crisis would get in the way of ongoing peace negotiations. 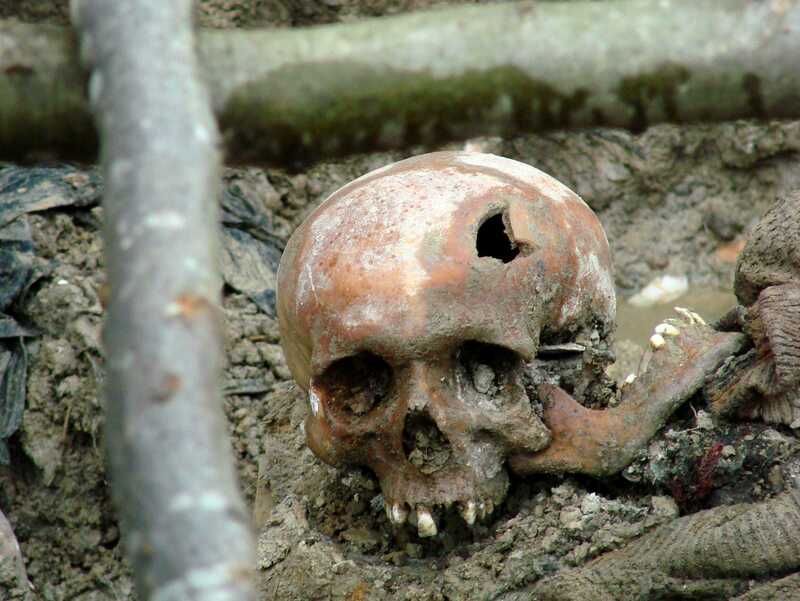 Adam Jones via Wikimedia CommonsHuman remains uncovered near Srebrenica in 1997. The slow Western response, and the failure of the UN to prevent one of the worst single atrocities anywhere since World War II despite the presence of its peacekeepers, raise serious questions about how outside actors should intervention in regional conflicts. Srebrenica exposed the US, NATO, and the UN’s fatal disorganization and indecision and raised still troubling questions about what the world’s responsibilities should be when thousands of lives are in imminent danger. What does it take for world powers to step in and stop human-rights abusers before they can commit Srebrenica-like atrocities? When should international actors step in? If they do decide to intervene, which moral and political responsibilities do they assume? Is a country ever obligated to rescue people when it doesn’t have a clear strategic or political interest in doing so, and should the moral imperative of protecting innocents ever override all other concerns? Even 22 years after Srebrenica, there’s still no clear answer.